The number of patients with valvular heart disease (VHD) is steadily increasing in developed countries as the population grows older and these patients often present comorbidities, which makes decision-making difficult and challenging. International guidelines on VHD are updated and widely available. However, there is a substantial discrepancy between guidelines and clinical practice in the field of VHD and many patients do not undergo surgery despite having clear indications. Thus, implementation of guidelines in patients with VHD represents an important public health problem. 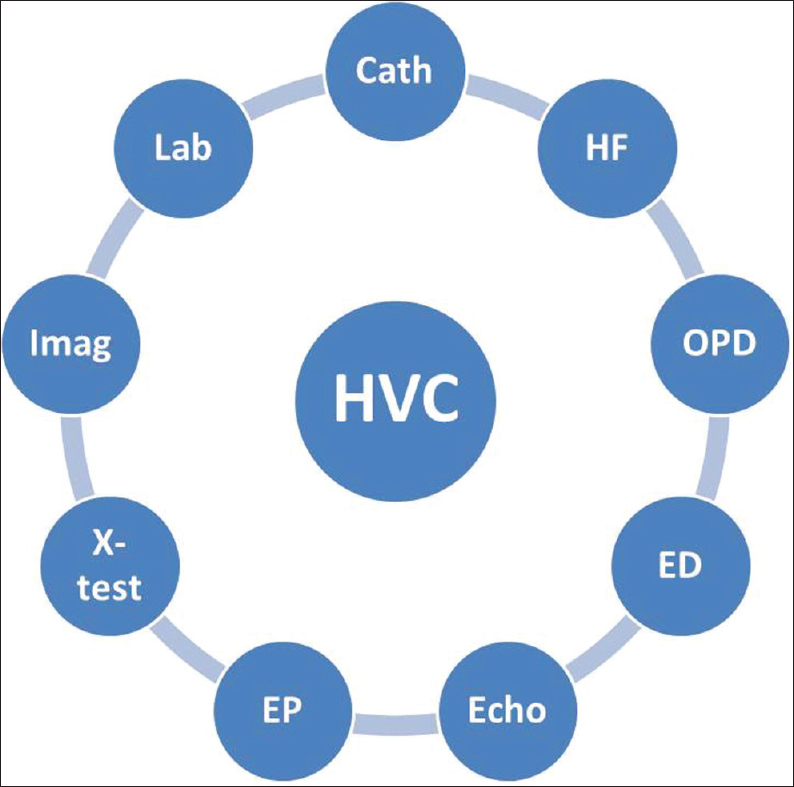 The main functions of the HVC are as follows: (i) to improve patient care; (ii) to optimize the use of proven diagnostic tests and therapies; and (iii) to improve the level of adherence to current evidence and guidelines. 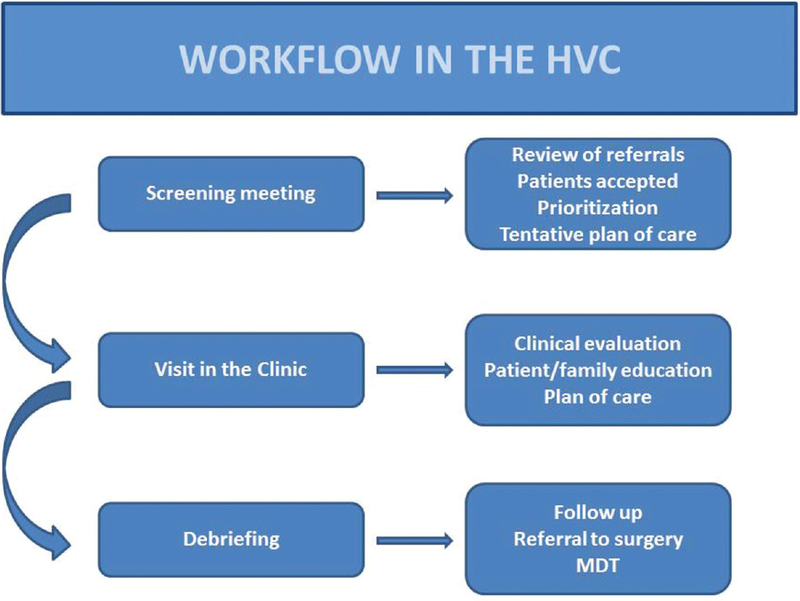 Of note, the role of the HVC is to assist the referring cardiologist in the decision-making process [Figure 1] and if necessary, to deliver targeted care and appropriate monitoring to patients with VHD. Hence, the HVC represents a well-defined structure running on a permanent basis in the Cardiology Department. Why a Heart Valve Clinic at the Heart Hospital in Doha? At the Heart Hospital in Doha, Qatar, VHDs were often managed by general cardiologists and the adherence to the international guidelines was less than optimal. Moreover, there was no continuity of care for these patients (different doctors involved at different times). Finally, information and education provided to patients with VHD were often scanty or incorrect, thereby leading to inappropriate delays in decisions about surgical or transcatheter valve interventions. The HVC at the Heart Hospital in Doha, Qatar, is operational since May 2017. The model is organized as a consultative physician-nurse-based clinic, where a cardiologist with expertise in VHD and a specially educated nurse are in charge of the HVC. The HVC runs on a weekly basis (every Monday), from 8:00 am to 3:00 pm. The clinic is fully integrated with our OPD, echocardiographic laboratory, exercise test infrastructure, blood tests, cardiac catheterization laboratories, and with easy cross-talking among the different structures [Figure 2]. Patients referred to the HVC are discussed in a weekly screening meeting where cardiologists and nurses involved in the HVC assess if the referrals fit our indication [Table 1], review the file in our electronic medical record (EMR) system, prioritize the patients, and prepare a tentative plan for the next visit, including investigations needed before the visit (transthoracic echocardiogram, transesophageal echocardiogram, stress echo, computed tomography/magnetic resonance imaging, blood tests, etc.). The list of the patients accepted for the HVC is finalized by the nurse and circulated among the HVC physicians. The nurse contacts the patients, arranges the appointments for the planned investigations, and makes sure that all the tests are properly performed before the visit to the HVC with results available at the time of the visit. On arrival, the patient is questioned by the nurse involved in the HVC concerning medical background and symptoms, using a specific template. The nurse has the initial task of measuring weight, height, waist, and blood pressure, and recording a 12-lead ECG. The nurse may also help to establish links between the patient and other specialists for specific support. Both cardiologist and nurse inform and educate the patient and close family members about VHD, in particular to improve the patient's understanding of their disease and to motivate them to follow their prescribed medication. At the end of each consultation, a standard report is generated by the cardiologist and by the nurse in our EMR system. Decision-making can be discussed over the phone with the referring physician and if needed, with other specific actors not involved in the HVC. The nurse sets up future investigations and appointments. Finally, a debriefing session is held during the following screening meeting. The whole workflow is summarized in [Figure 3]. Patient with severe VHD may have multiple comorbidities, and the decision of the best strategy in these patients is often challenging. Clearly, the final decision on the optimal plan for such patients needs a discussion among a multidisciplinary team (MDT) that in our setting includes cardiac surgeons, cardiac interventionalists, cardiac anesthesiologists, cardiac imaging, clinical cardiologists, and plus other specialists that can be involved when needed. Collaboration with heart failure and electrophysiology services is also necessary to ensure that medical therapy (and cardiac resynchronization, if indicated) has been optimized before considering surgical or transcatheter intervention. Patients evaluated in the HVC who need a multidisciplinary approach for clinical decision are referred to the MDT that meets on a monthly basis (unless urgent cases). During the MDT meeting, cases are presented and discussed among the different specialists. The consensus of the meeting is documented in the EMR and is communicated to the patient at the next follow-up visit. Over 6 months, since the opening of the HVC at the Heart Hospital, we have evaluated 92 new and 43 follow-up patients. Of these patients, 14 (15%) were discharged from the HVC and referred to the General Cardiology clinic, 16 (17%) were referred for cardiac surgery, and 8 (8.7%) were referred for interventions (5 percutaneous mitral valve balloon valvuloplasty, 1 percutaneous closure of prosthetic paravalvular leaks, 1 balloon aortic valvotomy, and 1 percutaneous mitral valve repair). The challenging cases (22 patients, 24%) were presented in the Heart Valve MDT where the different (sub) specialists had the opportunity to discuss in detail the cases and to provide their opinion. There is much corroborative evidence that specialist clinics are better or more cost-effective than conventional care. Our experience corroborates data from other centers showing that patients with severe aortic stenosis have symptoms detected earlier and at a lesser severity within a valve clinic compared with those referred from other clinics. Another intrinsic advantage of the HVC model is that communication among different specialists is facilitated. The HVC network avoids delay in the examination and decision-making, prevent physicians' inertia, and eventually provides optimal care to the patients. At the Heart Hospital in Doha, Qatar, we found a substantial discrepancy between guidelines and clinical practice in the field of VHD. According to the Position Paper by the European Society of Cardiology, we have implemented an HVC model that is a good example of MDT approach. All the decision-making process is strongly based on international guidelines, which provides optimal care for patients with VHD. Special thanks are extended to the Heart Valve Clinic nursing staff Aziz Ali Mohamed, Elsa Teena Varghese and Tessymma Shiju. Lancellotti P, Rosenhek R, Pibarot P, Iung B, Otto CM, Tornos P, et al. 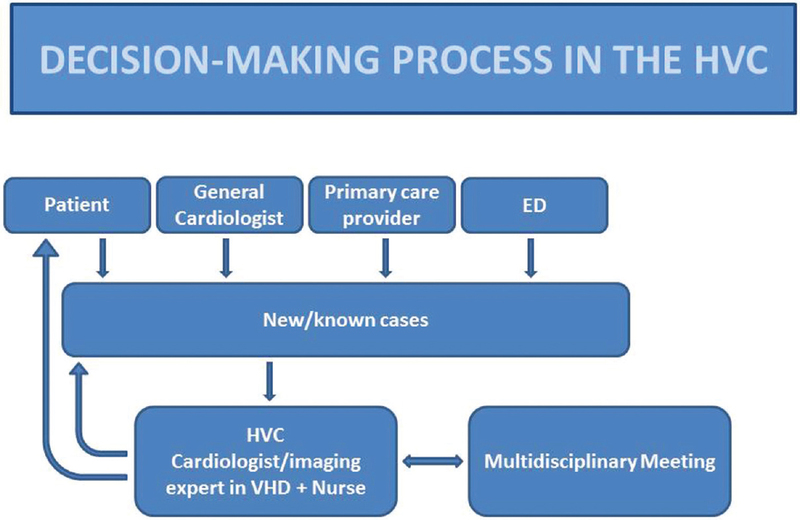 ESC working group on valvular heart disease position paper – Heart valve clinics: Organization, structure, and experiences. Eur Heart J 2013;34:1597-606. Zilberszac R, Lancellotti P, Gilon D, Gabriel H, Schemper M, Maurer G, et al. Role of a heart valve clinic programme in the management of patients with aortic stenosis. Eur Heart J Cardiovasc Imaging 2017;18:138-44.